Posted 18 October 2010 in Bonus, Where Fourth Art Thou? Essays. Posted 10 October 2010 in Bonus, Where Fourth Art Thou? Essays. 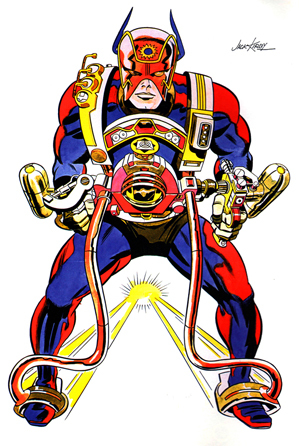 Carmine Infantino had been known much of his career at DC as the quintessential artist on The Flash and on “Adam Strange.” His art style was not unlike Kirby’s in some ways — it was kinetic, always in motion, well-designed and vibrant — and you can sense in the work a passion for the sleek and the modern, epitomized by his futuristic cityscapes in Mystery in Space and exploits of the Scarlet Speedster. When DC Comics, flush with Batman TV show merchandising money and buyer Kinney National Services’ hunger for “leisure time” industries, was sold, big editorial shake-ups were already in progress at the Lexington Avenue offices. The artist (“Enfant Rouge” was his self-styled nickname) was not only supremely talented, he was also ambitious to establish himself on the business side of things. Posted 3 October 2010 in Bonus, Where Fourth Art Thou? Essays. It is now part of Kirbyhead lore that Jack, after having created some of the most exciting and resonant super-hero adventures in comics, was becoming increasing dissatisfied with his standing at Marvel by the late ’60s. Though it is said he received one of the highest page rates at the House of Ideas, Jack was still just work-for-hire, on one hand creating the very cast and canvas that was attracting an ever-growing readership, on the other, not sharing in ownership of the profit engine. It’s important to note, too, the artist/writer (the King plotted most of the stories he drew, with Stan scribing the captions and dialogue from Jack’s margin notes — later dubbed “the Marvel Style” of comics production) was becoming frustrated with the creative end of things, as well. 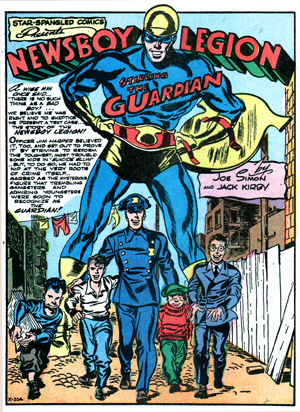 Thus, when Stan kept the news from Jack that Marvel was developing a new title — giant-size for 25¢, at that! 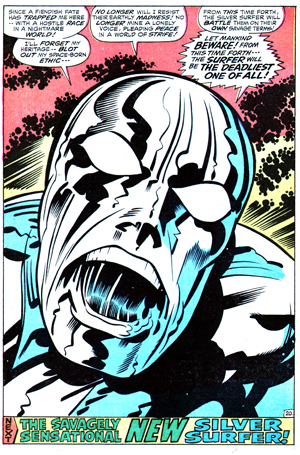 — and assigned Silver Surfer art chores to the more artistically slick John Buscema (who had picked up and adapted the Kirby approach to bombastic action under orders from Marvel’s editor), and Jack saw the finished result, it must have been crushing. The origin story in SS #1 depicted the character as a love-lorn and self-pitying lost soul, seeking contact with earth folks and yet always running off (“Shane! Come back, Shane!”). 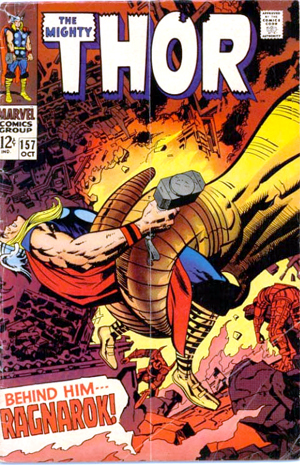 Thirdly, and most relevant to this ongoing examination of his Fourth World, Jack had imagined a radical idea: In the pages of The Mighty Thor, completely eradicate the pantheon of Asgardian gods (as prophesied in ancient Norse mythology, on which Jack’s Thunder God & Company’s adventures had sprung), by bringing on Ragnarok, the twilight of the old gods, the end of Asgard, the death of the immortals, the arrival of the Valkyries to take the dead Viking warriors to their final rest in Valhalla… The Kirby innovation, besides exterminating a whole crew of characters that presumably made some shekels for Marvel, was to have new gods arise from the aftermath of the apocalyptic conflict, a new cast of celestial beings, not speaking in faux Shakespearean thee’s and thou’s as did Odin and his ilk, but rather super-beings rooted in modern-day, relevant concepts (the threats to our natural environment, the rise of malevolent technology — Life versus Anti-Life, as such) concerning us little folk. Needless to say, Stan passed on Jack’s reconception, preferring to keep Goldilocks as is, and consistently reviving (but never fulfilling) the teasing threat of Nordic Armageddon over the title’s span. A review of Jack’s late-’60s work reveals his unwillingness to create new characters and concepts for the Marvel imprint after a cosmically fruitful surge of creativity during the decade’s middle years. Between 1965 and ’67, for instance, Jack would introduce in the pages of Fantastic Four the Inhumans, Galactus, the Silver Surfer, the one-issue masterpiece “This Man, This Monster,” the Black Panther, the Kree empire, and “Him,” who would later evolve into Adam Warlock. Thereafter, while still plotting and drawing vibrant and engaging adventures, it seemed Jack was reticent to continue producing original stories and guest-stars for the publisher. Future investigation would reveal that, far from fermenting new ideas in his awesome (Kirby-sized!) imagination, Jack was privately conceiving of a new line of concepts and characters, musings he began with his End-of-Asgard notion, in titles he would helm as writer and editor, as well as artist. By 1969, while still plotting and penciling for Marvel (and receiving increasingly frustrating creative interference from the editor), Jack was secretly negotiating with DC Comics, the industry leader nervously watching the House of Idea’s ascent in the volatile marketplace of American comics. 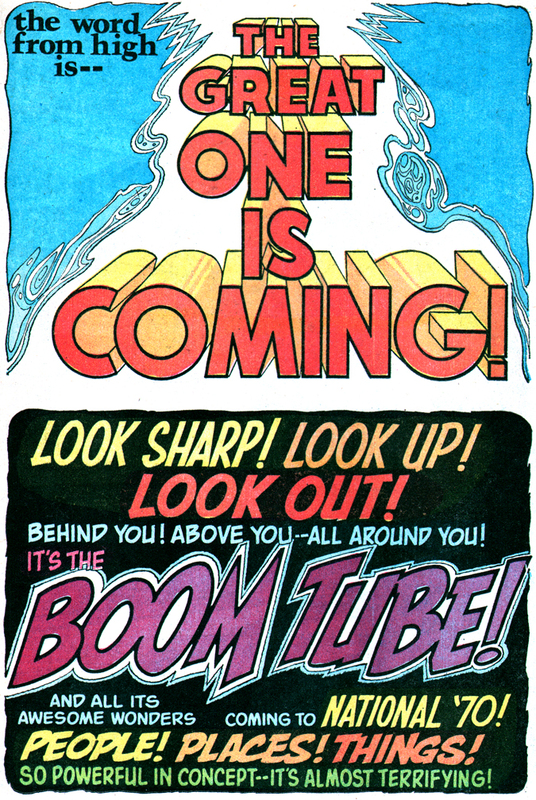 (By the mid-’70s, Marvel would, indeed, surpass DC as the number one comics publisher.) The artist met with Carmine Infantino, creative head (and soon-to-be publisher) of DC, and the King gave “Rouge Enfant” a full-blown presentation, which the editorial director approved. 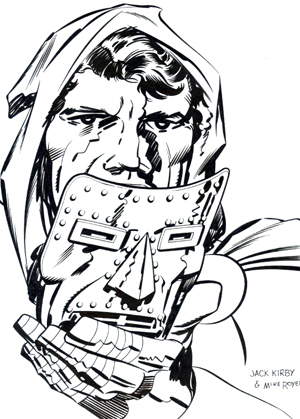 Contracts were signed, notice was given, and Jack Kirby was poised to start on perhaps the most creatively important chapter of his remarkable career.